Our New Mexico genealogists are available to research on location. They will find and analyze the best records available to further your family history research. They can search the archives and libraries in New Mexico, as well as help you with other special requests. The New Mexico State Records and Archives in Santa Fe is known as the best genealogical source in the state. They preserve a variety of different genealogical articles in their archives. They hold historical manuscripts, government records from 1621 to the present day, county records from 1850 to 1912, and Catholic church records. They also hold private records including diaries, letters, and wills. The National Hispanic Cultural Center in Albuquerque focuses on the history and culture of the Hispanic population of New Mexico, the southwestern region of the United States, Mexico, Central America, and even Spain and Portugal. Their genealogical resources include 2,000 films of colonial history. They also hold Hispanic genealogical publications, as well as historical maps of towns and counties. The New Mexico Genealogical Society contains Census records, updated Martin Serrano Genealogy, and burial records for the Rio Abajo region (Southern New Mexico). The society contains journal indexes since 1962 and church and baptism records, most of which are in Spanish. The Fray Angélico Chávez History Library is located in the Palace of the Governors, the original location for the government of local Spanish rulers in the 17th century. The library includes exhibits and archives that focus on the Spanish colonial period from 1540 to 1821. They also hold records relevant to the period when modern-day New Mexico was under Mexican control and progression to statehood. Other topics of interest among the archive’s collections include prominent figures in New Mexico’s history, information on the Santa Fe Trail, as well as the Civil War, Spanish-American War, and World War I. The New Mexico State Library is home to the largest book collection in the entire state. Their archives include genealogies, maps, periodicals, and biographies. 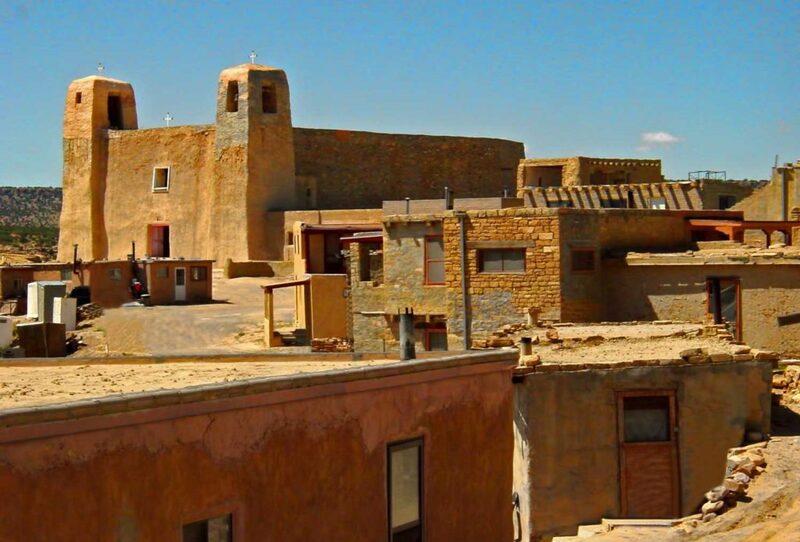 Their Southwest Collection is an elaborate archive containing information on the history of New Mexico, including information on Indian pueblos and reservations. The library also holds collections specifically focusing on state and federal documents. The New Mexico State University Library’s Rio Grande Historical Collections have family records starting in 1598 for families that lived alongside the Camino Real (also known as the Spanish Mission Road). This was the route of Spanish settlers who came to colonize the new territory of the Spanish Empire which later become New Mexico. Their records include data about the land stretching from the Sangre de Christo Mountains of Colorado down to Mexico City. The Albuquerque and Bernalillo County Public Library’s Genealogy Center focuses on genealogy and Southwestern history. Their collection consists of over 20,000 titles and 31,000 volumes organized by country, state, and county. Their genealogy records include family history books cataloged by surname, yearbooks from Albuquerque high schools, Albuquerque city directories, and extraction books for New Mexico Catholic church records. The University of New Mexico’s Center for Southwest Research and Special Collections preserves historical manuscripts, books, photographs, recordings, and even architectural drawings. They hold the largest collection of archival works written in Spanish and include early Mexican records. The Historical Society for Southeast New Mexico works to preserve the history of the region of Southeast New Mexico. They contain a collection of rare and historical books, over 14,000 photos, hundreds of manuscripts and maps, audio tapes, and newspapers. Their indexes include information on the earliest pioneers in the region, as well as information on cattlemen and miners. The Roman Catholic Archdiocese of Santa Fe was created in 1850. It split off from the Archdiocese of Durango in Mexico. During its early history, the Archdiocese of Santa Fe included parishes from Colorado and Arizona. The archdiocese’s archives house records for each of the three states from 1678 to 1950. On average, New Mexico receives only 8 inches of rain per year. To the inhabitants of this desert region, water has always been important. There are historical record collections about water usage and water rights. These records are a great location to search for your ancestors. All water in the state, both surface and groundwater, belongs to the public and is subject to the Doctrine of Prior Appropriation. The first person to take a substantial amount of water from a water source for “beneficial use”, meaning agricultural, economic, or household use, can continue to use it. Those who come afterward can use the water source as long as they do not impinge on the first user’s rights. Water rights are transferable the same way that any other land right is transferable by deed, by lease, etc. These records are particularly valuable because they are kept separate from other land records and may provide information that other land records do not contain. Records also exist for lawsuits and disputes over water rights, and are an excellent source of information. Our New Mexico genealogists specialize in researching several types of documentation and are not limited to the list above. For more information or specific inquiries about our genealogists, please feel free to contact us.